I’ll take it as a compliment! 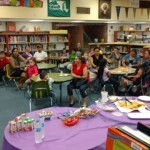 Our school recently held a parent night for our Spanish speaking families. I stood at the front of the school opening the door and greeting families as they arrived. The turn-out was nice and included many of our students. After some refreshments, one of our first grade teachers took the students to her classroom for some fun activities while our EL teacher and community liaison worked with the parents. The parents participated in warm-up games to help them get to know each other. While we sometimes see our Spanish families as one group, they often represent many different countries, backgrounds, and cultures. Even so, the Spanish language is what connects them. As educators, we need to find opportunities to get our English learners and their families together. The parents who attended our event were enthusiastic and excited to be included in their child’s school. You could tell that they appreciated having an interpreter there to listen to and ask questions of. They also shared how much they appreciated our efforts and how much their children love their school. When I welcomed the parents to our event, I told them how important it is to our staff that they feel connected to the school. Their language should never be a barrier to helping their children succeed. We should be breaking down walls, not building them. I also stressed how important it is that they keep speaking Spanish to their children. Spanish families don’t have to give up their culture or language when they come to America. Toward the end of the night, the parents had a chance to share and ask questions. One of the parents stood up and with a wry smile said, referring to me, “I thought he was a security guard because he is always outside greeting people.” This brought raucous laughter from the whole group and illustrated the cultural differences in the parents’ educational experience in their home countries. Many of them had never had the opportunity to interact with a “director” (principal). At first I thought that being identified as a “guardia de seguridad” by our EL parents might be an indication that I need to do a little PR work with them. The more I thought, however, the more I realized it was a compliment. If they see me as someone who is protecting the school, that’s a good thing. That night was one of those special times when you realize that what you do matters. It was satisfying to know that our Spanish speaking families appreciate the efforts of our staff. They value their families and love their school because their children are happy. They want to be involved, but don’t always know how. They trust in their school and yes, they sometimes see their principal as a security guard. I’m okay with that. I’ll take it as a compliment.